The Fitbit (NYSE: FIT) IPO date is set for Thursday, June 18. The deal is one of the most anticipated tech deals of 2015. Fitbit will be the first standalone wearable tech company to go public. That's significant considering wearable tech is an exploding market. It's projected to be worth $19 billion by 2018. 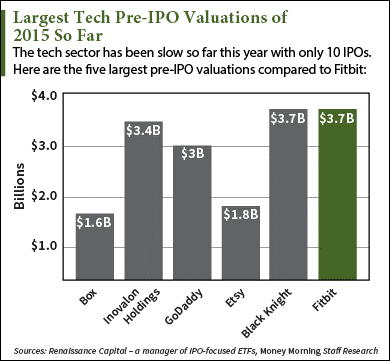 What is the Fitbit IPO price? Fitbit Inc. (NYSE: FIT) set a price range of $14 to $16 a share for its IPO. The company will announce a final IPO price the evening of Wednesday, June 17. How much money will the Fitbit IPO raise? Fitbit will sell 29.85 million shares. At the midpoint of the price range, the Fitbit IPO will raise $448 million. How much is Fitbit worth? After the IPO, Fitbit will be valued at $3.7 billion. It will be tied with Black Knight Financial Services Inc. (NYSE: BKFS) as the most valuable tech IPO of the year, followed by Inovalon Holdings Inc. (Nasdaq: INOV) at $3.4 billion and GoDaddy Inc. (NYSE: GDDY) at $3 billion. What kind of company is Fitbit? Founded in San Francisco in 2007, Fitbit is a consumer electronics company known for its wearable devices of the same name. According to its website, Fitbit's mission is to make products that "fit seamlessly into your life so you can achieve your health and fitness goals, whatever they may be." Fitbits are wireless activity trackers that measure health metrics like calories burned, quality of sleep, and number of steps walked. There are six different models – Zip, One, Flex, Charge, Charge HR, and Surge. The products caused controversy last year when Fitbit did an involuntary recall of the Fitbit Force. The recall came after roughly 9,900 customers who purchased the Force experienced skin irritation and rashes. The Consumer Product Safety Commission said it was caused by "allergic contact dermatitis." The Fitbit Force has since been made unavailable to buy on the company website. How much money does Fitbit make? Fitbit has enjoyed enormous sales growth over the last five years. Sales skyrocketed from $14.5 million in 2011 to $745.2 million in 2014. Over the same period, Fitbit went from a loss of $4.3 million to a profit of $131.8 million. Last quarter, its devices constituted 85% of U.S. wearable fitness devices and revenue grew 209% to $337 million. According to market research company The NPD Group, Fitbit has sold 20.8 million devices as of March 31.
Who are the underwriters of the Fitbit IPO? The joint underwriters for the deal are Morgan Stanley (NYSE: MS), Deutsche Bank AG (NYSE: DB), and Bank of America Merrill Lynch. Does Fitbit have any competition? Fitbit admitted in its IPO filing that it faces stiff competition from both electronics and traditional fitness companies. Fitbit's most dominant competitor is Apple Inc. (Nasdaq: AAPL) and its Apple Watch, which has health and fitness tracking capabilities. According to a survey by Fortune, Apple Watch sales estimates in 2015 range from 8 million to 41 million, with an average of 22.6 million. That average beats Fitbit's total sales of 20.8 million by 8.7%. Apparel companies like Nike Inc. (NYSE: NKE) and Under Armour Inc. (NYSE: UA) also pose a threat. These firms are starting to produce tech-supportive apparel – or "smart clothing." Smart clothing sales are supposed to hit more than 10 million units this year and 26 million in 2016. As wearable tech grows into a $19 billion industry, there may be enough room for both Fitbit and its competitors. But since wearable tech is still in its infancy, there's no telling who will survive. But does that mean you should buy into the FitBit IPO?